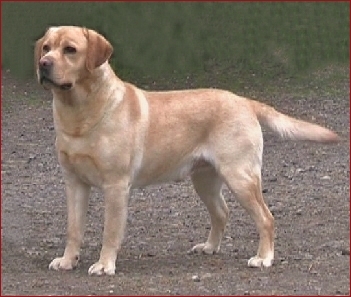 Alfie is a solid, medium-sized dog with excellent pigment and of impeccable temperament. He's a happy, friendly, easy-to-live-with type and is wonderful with children, cats and other dogs. Alfie has produced some fine progeny over the years, very much in his mould, and is now enjoying a wonderful retirement on a working farm, where we’re comforted to know he’s adored!